The central focus of this study is to provide an improved basis for articulating the politics of transnational television and its potentials for improving relations among nations. In this context, the politics of transnational television means the decision-making process that determines the degree of freedom of the press tolerated by individual governments and how that could affect broadcasting mode and attitudes toward other nations. 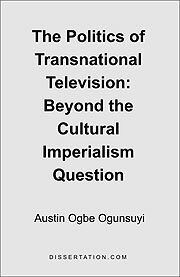 The motivation for this research stems from a conviction that the cultural imperialism perspective on the nature and modes of transnational television are erroneous and therefore susceptible to a wide and often misleading theoretical assumption, with wide ranged implications. In reevaluating the concept of cultural imperialism, some fundamental questions are raised to determine to what extent its arguments are true. Using the elite theory of power in various societies, aided by Johan Galtung's model of a global communication in four worlds, we see a pattern of global television that suggests a similar motivation underlying media ownership in all societies. We acknowledge, with the support of a literature review and other data sources, the existence of a global systemic order where technology rich nations dominate technology over poor nations. But there is also substantial evidence to prove some of the poorer nations exercise some degree of autonomy. This makes it more difficult to explain cultural imperialism simply as a relationship where developed and developing nations are arranged in dominant/subordinate or top/down order. Through a strategy of original intent, we are able to show the elite in various societies acquire television mainly to satisfy their political, economic, or social interest. Media attitudes, therefore, are largely the ideological expression of local elite who determines foreign policy.